A fully decked V-6 with all-wheel drive and all the options is feels much more opulent than the sticker indicates. We're sure that you'll agree. The 2017 Genesis G80 is one of the first new cars from the nascent luxury carmaker, and it's a good leg to stand on. The Genesis name takes on a new meaning now. 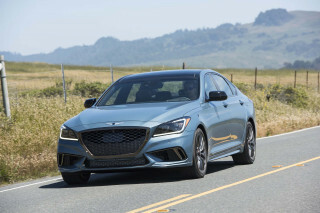 The Genesis G80 (nee Hyundai Genesis) was the car that launched a luxury flagship for Hyundai and will now chart a new course for the nascent brand. The G80's overall style is nearing a crossroads. 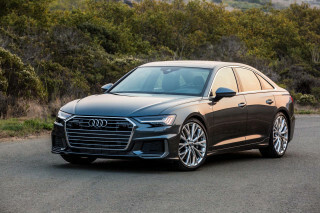 Audi influence is immediate up front; BMW's style along the side is apparent too, but the G80 is starting to make waves on its own front with a crisp character line and an softer take from the rear that's more true to its mission. Inside, the G80 doesn't excite many with so many horizontal lines, and the center time piece doesn't feel quite in character—at least not yet. Under the hood, a stout V-6 and big V-8 are available—both mated to an 8-speed automatic—and all-wheel drive available only on the smaller engine. That's OK, the V-6 is our pick anyway thanks to its 311 horsepower and relative light weight compared to the V-8. The 420-hp makes good noises, and unlocks the biggest wheel option, but its nose-heavy character and mild acceleration bump makes it entirely extra credit—and the G80 doesn't need better grades anyhow. Lotus engineering helped sort the rear-drive, V-6 model and it shows. An excellent composure and ride falls down on spirited canyon runs, which we don't guess many G80 owners will make. The G80 may be down a little on space compared to some, but its efficient packaging and use of space makes it comfortable for four adults all the time. We'd prefer a little more trunk space and split-folding rear seats, but that has spoiled the excellent ride in the past. When we're looking closely, the Genesis lacks some of the polish found on other luxury sedans, but it's really only here—in the minor stuff—that the G80 shows its budget bottom line. Overall, the cabin is isolated from noise and vibration, and it stands up to sedans that cost tens of thousands more, which begs the question: How much do you really want to pay for a badge? The G80 aced federal and IIHS testing—and it aced ours. Active safety features are standard this year, including forward collision warning with automatic emergency braking, blind-spot monitors, and active lane control. 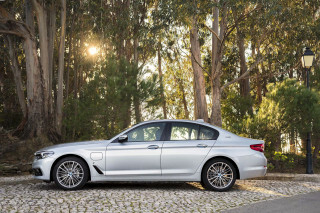 Luxury options have been trimmed this year, only because the G80 comes so handsomely equipped. Base models get active safety and an 8.0-inch touchscreen for its infotainment system, Apple CarPlay/Android Auto, Bluetooth connectivity and streaming, leather upholstery, Hyundai telematics, power adjustable and heated front seats, hands-free trunk opening, and keyless ignition. Spending so much money on the inside hasn't left much for fuel saving tech underneath. The G80 features direct injection to help save fuel—and that's about it. No hybrid or alternative powertrain yet, so it has room to improve on our fuel economy scale. 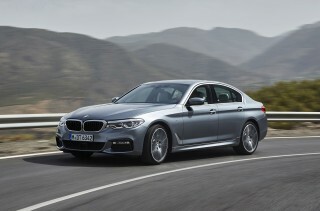 The most popular model will hover around 22 mpg, according to our drives and EPA figures. Even if it borrows from some, the Genesis G80 is good looking—and ready to chart its own path soon. The Genesis G80 is approaching a turning point. At once, the luxury car emulates others that cost much more, but also sets out on its own path. As the first of two cars in the flagship luxury brand for Hyundai, the G80 sheds any badges with an H on it and will attempt to become a lucrative marquee out from under the Hyundai shadow. The first-generation Genesis had a pleasantly anodyne body, with just a few flares of South Korean style in its grille and secondary controls. The latest G80 goes out of its way to blur even those touches, adopting a new roofline and grille that are striking in combination. That corporate hexagonal grille has been smoothed over in the G80, with a somewhat more ornate look in the Genesis than, say, the Sonata. From the front, the Audi influence on the G80 is immediately recognizable, and down the sides, we can even spot some BMW. Around back, the look is much softer. Inside, the big luxury sedan trades some vertical shapes and curved silhouettes for straight lines and sharp edges. 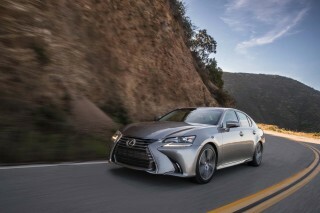 Lexus has gone a similar route with its latest sedans, emphasizing horizontal lines and a flatter presentation that's more flattering than before. The corners of the vents flanking the central touchscreen point angle off on opposing tangents; the rectangles that divide out the space for the shift lever, cupholders, even the clock impose a regularity on the console that seems slimmer but looks more substantial. The square timepiece acts as a central visual point for the controls otherwise, which put climate and audio controls just beside and below; the dash bypasses the entirely configurable screen-based gauge clusters of some current models and instead goes with nice, neat analog electroluminescent gauges. It's no sport sedan, but it's not really trying to be either. Nothing has changed in the move from last year's Hyundai Genesis to this year's Genesis G80, and that's a good thing. 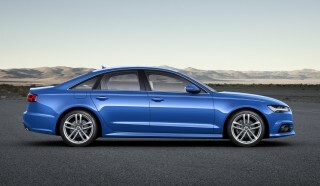 Base cars are powered by a 311-horsepower, 3.8-liter V-6 that makes 293 pound-feet of torque. It's paired exclusively to an 8-speed automatic that lets the V-6 rev up its range, and is rear-drive, or all-wheel drive if optionally equipped. The base 3.8-liter V-6 is our pick as the best in the range thanks to its relatively spry handling and sharp acceleration. In 2015, then-Hyundai employed famed sports car company Lotus to help improve the Genesis in handling and road feel. That amounted to a significant tuning change and its steering is far better than expected; the new electric variable-ratio power steering has rack-mounted motor assist and feels like it could translate with no changes to a true sport sedan. It's neither overly heavy on center nor artificially light, and it loads up nicely with heft off center; it's also a perfect model for the kind of steering calibration Hyundai needs in its other vehicles. The V-8 engine at the top of the range is mostly for buyers who can't leave a box unchecked. Its acceleration isn't all that different from the V-6, and its 420 hp and 383 lb-ft of torque are best for spec hunters looking for bragging rights. Its rear-drive only, and more nose heavy than the V-6. There's an available Continuous Damping Control air suspension that can be toggled from Normal to Sport mode, but we thought that model neither rode nor handled quite as well as the less-nose-heavy V-6, although it did manage to filter out some roughest bits of pavement. 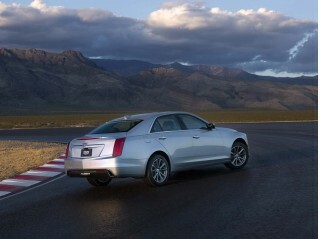 We say the V-6 is the most you need in a large luxury sedan, it's a matter of wants and needs. 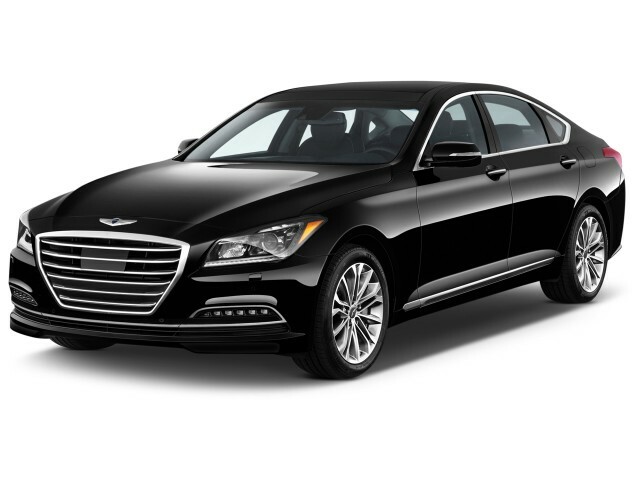 If most of your driving is on straight boulevards and freeways, the Genesis has all the performance you'll need—with an ideal mix of comfort mixed in, without ever feeling wallowy. Only if you regularly need to head over a mountain pass or along a canyon road will you understand (and care) that this definitely isn't a sport sedan. The Genesis G80 gets it right in overall quality and comfort, we'd just like a little more attention to the small stuff. The Genesis G80 is a luxury car first and foremost, although it can double as a fairly spacious people carrier when it needs to be. It's 15.3 cubic feet of trunk space is less than some compact sedans, and without any split-folding rear seats, we don't imagine it'll haul many two-by-fours on the way home from the home improvement store. For front- and back-seat passengers, the G80 is extremely comfortable thanks to plenty of room and a quiet ride. The front seats can be powered in as many as 12 directions, with four-way lumbar adjustment, heating, and ventilation. The rear seats can be heated as well in all-wheel-drive cars. 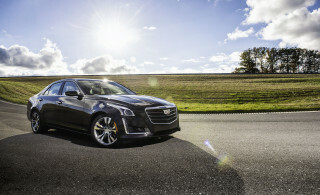 The Genesis G80 is built on a rear-wheel-drive platform, and while there might technically be less rear leg room here, but the Genesis feels roomier when it comes down to what matters for adults—getting in and out easily, and not constantly rubbing against the headliner or up with the moonroof housing. Getting in and out is far easier here than in the front-wheel-drive Hyundai Azera—with no need to duck when getting in and out—and the more upright package and more formal roofline adds up to a cabin that feels airier inside. The cabin of the G80 is a very nice place to be, but if you look closely, some of the finer details start to fall down. For instance, we've noticed in past years that the center-console cover, rather than using the sort of perfectly counterweighted or smoothly damped mechanisms that you’d see in some prestige-luxury cars, uses a simple hinge and little rubber bump stops. Some of the G80's switches and buttons don't have the same bespoke feeling as much more expensive cars—they're used throughout the Hyundai lineup—and we'd like a more comfortable grip on the steering wheel. It's hard to do better than perfect, and the Genesis starts there. For 2017, Genesis has heaped on more advanced safety features as standard to its list of impressive protection in the G80. This year's Genesis G80 aced every crash score and was a Top Safety Pick+ by the agency. As part of the agency's new criteria, the headlights on the G80 were rated at "Acceptable," which is enough for the prestigious nod. Federal testers have already given the 2017 Genesis G80 a perfect five (out of five) stars overall, with five stars across the board in every test. As far as official data goes, it's tough to do better than perfect. Every G80 comes equipped standard with forward collision warning with automatic emergency braking, blind-spot monitors with rear cross-traffic alert, active lane control, adaptive cruise control, and active head restraints. That's in addition to nine standard airbags, which includes a driver's knee bag that protects lower-limb injuries in a crash. Despite a modest price bump, the most you'll pay for a loaded G80 is still less than where others start. The 2017 Genesis G80 starts at heaps on more base equipment to its already impressive list of standard features, which helps justify its $2,650 jump in price over last year. The Genesis G80 sports an impressive list of basic features that includes forward collision warning with automatic emergency braking, blind-spot monitors, active lane control, an 8.0-inch touchscreen for its infotainment system, Apple CarPlay/Android Auto, Bluetooth connectivity and streaming, leather upholstery, Hyundai telematics, power adjustable and heated front seats, hands-free trunk opening, and keyless ignition. Adding all-wheel drive bundles heated rear seats and a heated steering wheel as standard. There's only one thing missing from that list that we can't understand: a rearview camera. That's buried in a $4,750 premium package that adds a sunroof, ventilated front seats, a bigger multi-function instrument display, and an upgraded stereo. The so-called $4,200 ultimate package adds to the premium package softer leather seats, wood trim, a head-up display, 9.2-inch touchscreen, a 17-speaker audio system, power trunk lid, but deletes Apple CarPlay/Android Auto. At the top of the lineup, the Genesis 5.0 Ultimate costs more than $55,500. On top of the ultimate and premium packages, it adds LED fog lamps, larger 19-inch wheels, quad exhaust tips, and illuminated door sill plates. It's worth noting that a fully decked V-8 G80 is roughly $2,500 more than a base Mercedes-Benz E-Class and $4,300 more than a base BMW 5-Series, without any options. No hybrid, no diesel, no one is perfect—the Genesis G80 still does reasonably well in gas mileage. The 2017 Genesis G80 won't count "green" among its many accolades because the mid-size luxury car eschews any hybridization or diesel powertrain—even stop/start—to keep its price low. That's in contrast to a majority of the mid-size segment that offers either small-displacement turbocharged engines, diesel, or hybrid powertrains to stretch between gas station trips. The way the EPA sees it: Rear-drive G80 sedans will earn 18 mpg city, 28 highway, 22 combined. Adding all-wheel drive for snow-belt states drops that score considerably to 16/25/19 mpg. The V-8 version isn't far off at 15/23/18 mpg, according to the EPA. In an early drive on mostly wide-open expressways and rural two-lane highways, we saw an average of about 25 mpg with a rear-wheel-drive V-6 model and nearly 23 mpg with a V-8. 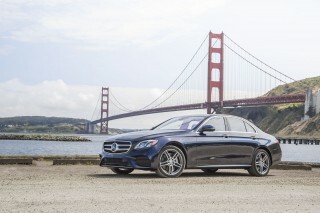 By comparison, the Audi A6 manages 21/29/24 mpg and the new Mercedes-Benz E-Class returns 22/30/25 mpg.